Lately I’ve been working with a 6 year old girl who finds using scissors tricky. She’s also struggling to hold a pencil properly for writing. It’s interesting how the two often go together. There can be many different reasons for having difficulties with scissors and holding a pencil skillfully, but one of the most common reasons that I see, is the inability to separate out the two sides of the hand. The two sides of the hand!? I hear you say. Yup, that’s right. Your hands are very complex little structures. There are arches, creases, tiny little muscles, fascias, nerves etc etc… AND two distinct sides of the hand. There’s the skillful thumb side of the hand and the stabilising little finger side. We see this when we use our thumb and index finger to pick up something tiny (i.e. : pincer grasp). 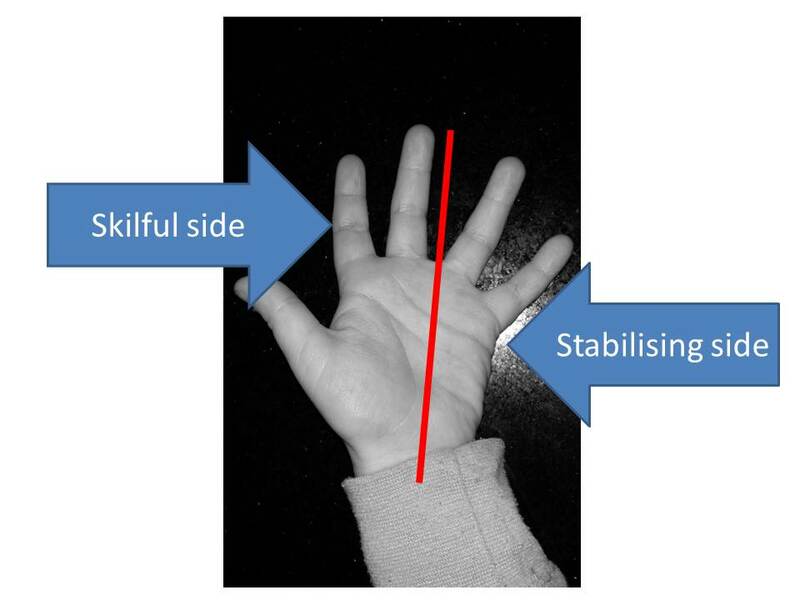 All of our other fingers curl away into our palm to stabilise our hand, while our index finger and thumb skilfully work to get the object you’re after. In order to use your fingers with great control and precision, each side of your hand needs to know what its special job is. 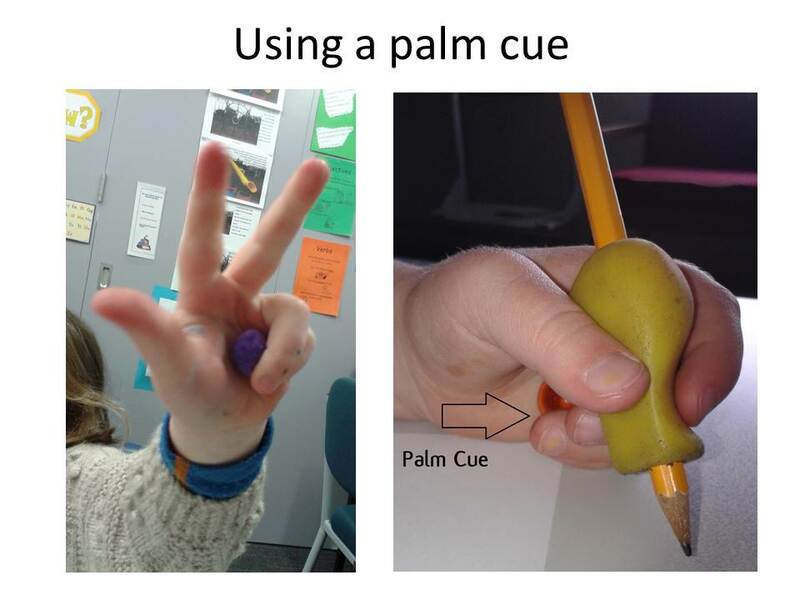 Take using a pencil as an example. 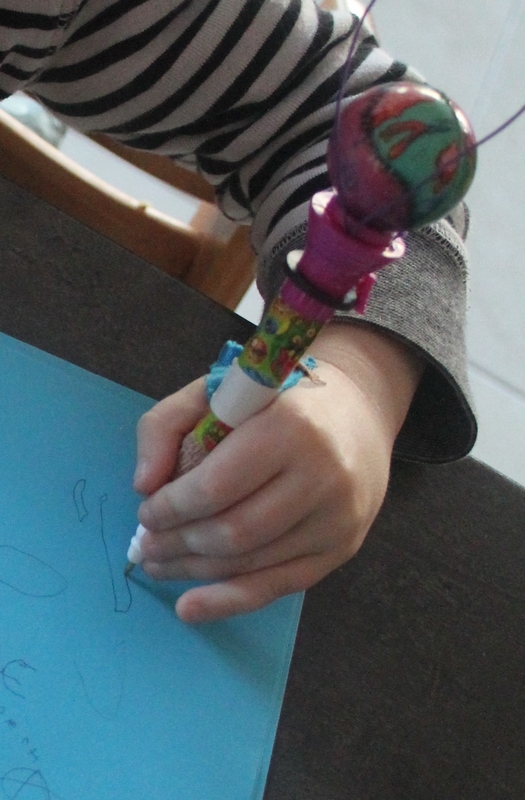 The thumb, index and middle fingers need to be able to skilfully grasp the pencil and move it around with enough fluency for writing or drawing, while the ring and little fingers must curl themselves away into the palm to help stabilise the hand. When the two sides of the hand are poorly developed, all the fingers tend to want to get in on the action. This makes it really difficult to perform smooth and well controlled movements which then impacts on the child’s handwriting legibility. Pop a marble, bead or other small object into your child’s palm and get them to hold it still with their ring and little fingers (we call this a ‘palm cue’). This should get them into the habit of tucking these fingers away. You can use this technique with the games/ suggestions that follow. 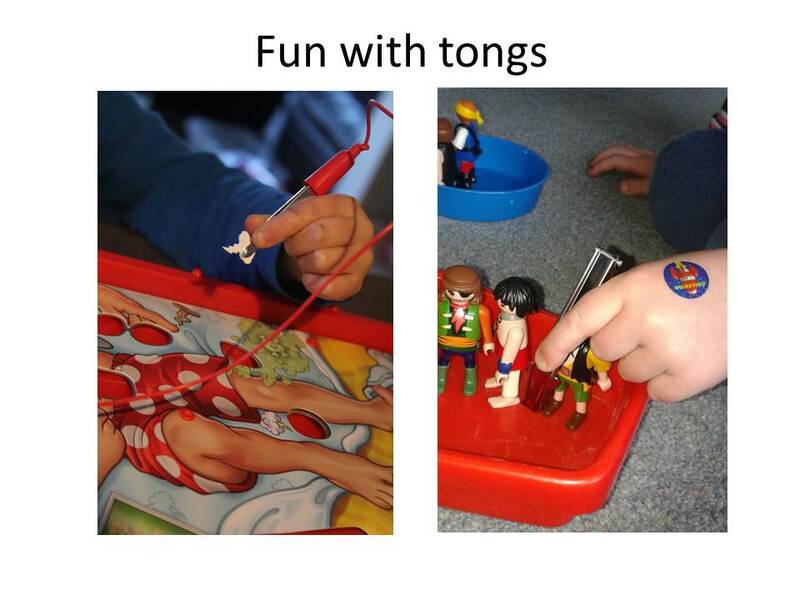 Playing games with tongs. Operation is a fun game with tongs. You can also make up your own tongs game. We like to ‘rescue’ toy pirates from their sinking ship with little tongs. Peg boards are lots of fun for encouraging a skillful pincer grasp. Table soccer. This is a great table-top game for two people where you flick a rolled up piece of paper at a target. Sometimes children want to use their middle finger and thumb to make the flicking motion, but you will need to encourage them to use their thumb and index fingers, while they tuck all the other fingers away. Spring loaded pegs are great for encouraging that pincer development. You can get your child to help peg out the laundry, or to peg up paintings to dry. We often paint faces onto paper plates and then use pegs for the hair. Games such as Connect Four or The Beetle Game are great for practicing tucking those little fingers away while working skilfully with your thumb, index and middle fingers. These are just a few examples and I’m sure you can think of many more. If you find that your child is still struggling after all this practice than it could be worth having an assessment with an Occupational Therapist. This is especially so if your child is struggling with things like doing up small buttons, fixing their zipper, using a knife and fork skillfully at mealtimes, and of course working with scissors and using a pencil.